So, Michel (flyer on WBF) and I had been discussing the trip for days, I finally put the golden gate on eurostar and took it to Brussels – he has the 40k Aries Cerat Signature dac, and the Impera II preamp. I have taken the Lampi on a train before but was not sure if it could go through the xrays – checked with Lukasz if it would harm the dac, he said no, so I went ahead. 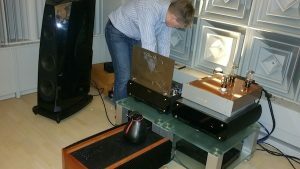 First we compared the ARC 5SE which he had borrowed for the compare, to the Aries Impera, with his Analysis Omega speakers. We played piano, baritone, soprano, pictures at an exhibition, and a complex tutti from Mendelssohn’s Elijah. We went back and forth a few times, sometimes on each track. The AR did what it does best – the midrange, air, and forwardness – with an intangible sense of involvement. Putting the Aries in, the noise floor was lower. It was quieter. That was the first thing I noticed. Compared to AR, the soundstage was more back and wide, cohesive. The piano tone was fuller and rounded and there was more linearity top to bottom. On an Oscar Peterson jazz piece, both the piano and the double bass stood out clearly on the Aries, while the piano was more forward with the double bass not as clear on the AR. The other compare we did while performing this exercise was between the CEC TLO transport and the prototype streamer that Michel owns (contact him for details). The CEC is supposed to be a top notch transport, so I was interested in doing this compare. Frankly, there was not much to analyse there given how equal the sonics were, so given the convenience and cost of the streamer, I don’t see myself getting a good CD spinner. After lunch, we put in the Lampi. 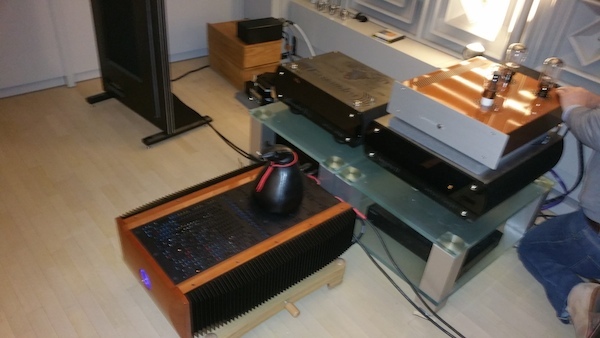 The gain between the Aries preamp and the Tenor 175 totalled 49db. The Analysis probably does 80 (published 86). I directly put in the Mendelssohn, and switched to the Aries for the compare. I had found the Lampi much superior to the Nagra with the EML special Lampi Globe Anniversary 45s, so here I had used those 45s. If anything, the Aries was marginally better – Michel sitting at my side could not hear the difference, but I accepted it. So, time for the nukes – I took out the KR 242s. 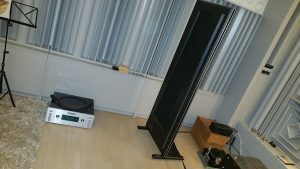 Put them in, and bang – without even warming up, the dynamics, stage, extensions, bass, depth, soundstage just zoomed. Every note was now reaching lower, and higher, and swinging through more. The crescendo was among the best I heard, with the Analysis filling up the whole space. We then played the baritone and the piano. The nuance on each piano note, tone, the dynamic range, the low to high, quiet to loud, was superb. So was the separation on Oscar Peterson and the bass notes. On Gnomus (Pictures at an exhibition), the pauses were so suspenseful. There is a clap like sound towards the end. 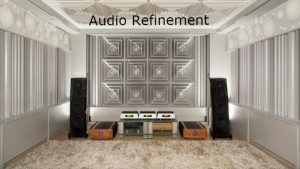 This was more dynamic with the Impera compared to the ARC Ref 5SE, but with the 242 in the dac the quickness of the strike was to behold. Now, the thing is, that the 242 is 16db higher. While Michel and I concurred on the 242 with the Lampi, Michel now realized that he had set his Aries up for the Rockport Aviors, and that he should change his bias for the Analysis. He had tried a couple of voltage adjustments, but now he took off the top, and increased the bias. Now, with the bias up, the tone of the Aries on the piano and the vocals became better than the tone of the 45s marginally. The difference with 242 decreased, but not sufficiently. The 242s ruled. There is gain, but then the 242 tube characteristic of drive and dynamism, resolution, and transparency is unparalleled. They are SS like tubes, with valves. Michel had been previously disenchanted with his Analysis set up, so I let him sit in the middle and enjoy it. The drive and dynamics were yuuge. I have heard Analysis Omegas sounding great before with NAT Transmitters, but with Tenor 175 I thought they were excellent. I then suggested changing to the Aviors. We moved the speakers, and now you had a speaker with higher sensitivity (published 90). Michel readjusted the bias. The first thing you notice when you replace Analysis with Aviors, is that the soundstage drops and recedes to the speaker. Depth is less, and baritone chest is less. This is irrespective of the dac. With Analysis, the bass exists in space – look at a vertical plane in front of you, and then look at bass on the 2D of that plane and add depth. With cones, I felt you could hear the woofers, the midrange differently, and the soundstage dropped. These are great cones though and better looking. I am a big fan of Rockport Grand Mira II. I find they do the planar characteristic with the conal. Now, with the Rockports in place we could not use the 242. 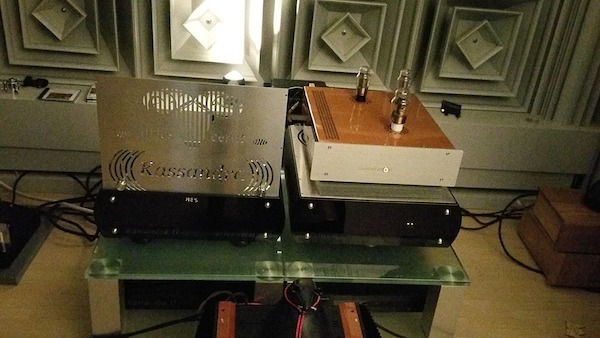 The Aries Cerat preamp + Tenor hybrid poweramp added 49db. 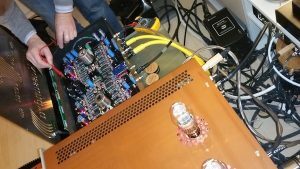 The 242s were overdriving the preamp and even at 1 were too loud. So we had to do with the special 45s. On special 45, now the difference on orchestral was less than with the Analysis. In fact, I told Michel I “thought” that the Lampi fills in the stage more. Michel agreed Lampi was more compact but felt the stage with Aries wider. So I heard again and did not hear a difference in the middle or away. So I gave up bothering. But on piano tone/body and vocals chest, the Aries were now sounding fuller, and better than the Lampi with the 45s. There is a key learning here into allowing flexibility of gain play for both manufacturers. 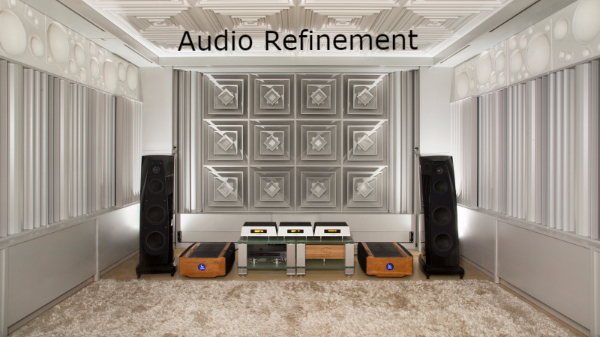 And for audiophiles. To allow for that flexibility of gain play, to suit your system. Anyway, the 2.5 hours back are a good time to brain dump in Eurostar. Did the train not star in Mission Impossible? As an appendix on the Lampi, please read the blind shootout between Big 7, Atlantic, Berkeley Ref 2, Ayre, and Chord Dave carried on by a guy and his wife for almost 6 hours at the place of Mike of Audioshark. Be the first to comment on "Aries Cerat, Lampi, AR 5SE, Analysis Omega, Rockports"